To be as fair as possible for this review of Like Drowning, I poured through Theatre Paradok’s social media pages and promotional material for insights and context on their 2018 fringe production. Camilla McMoody, one of Like Drowning’s directors, stated in an interview with studentnewspaper.org, that Like Drowning at its core is a production that asks “What is the theatre of the future?” This question is beyond intriguing, offering up beautiful and imaginative explorations of theatre’s newfound relationship with the digital age. While many other artistic mediums have fully embraced Web 2.0, theatre still seems trepidatious about its incorporation, so it’s refreshing to see a company embrace technology in its narrative. Like Drowning however, draws its true creative power from its collaborative script. In another interview, Directors Camilla McMoody and Penelope Hervouet explain that Like Drowning has been partially crafted by specially designed AI and cleverbots. These machines generated most of the script, in tandem with human editing, to craft this production. http://www.studentnewspaper.org/student-spotlight-like-drowning/. In doing this, the directors explain that they came to the realization that AI programs come with their own inherit set of biases and prejudice, and Like Drowning, according to its fringe blurb, tries to position itself as a piece that ‘explores gendered power relationships,’ and to what extent human prejudices around gender have influenced AI programs. What’s unfortunate then is that Like Drowning’s final execution does not seem to match up to the great effort and wealth of mythos invested in it’s construction. This is not a piece a viewer can go into cold; doing so will make for an extremely disorientating experience, as Like Drowning does not clarify any of this information in its runtime. This is troublesome, as it clouds the intentions of the piece. In order to better understand the thematic elements of the piece, or approach its central critique of gender, you need to go in fully-loaded with context. Otherwise, the piece’s surreal elements (it’s caricature characters, well-crafted props and excellent soundscape) fail to clearly represent the concerns that Theatre Paradok wish to dissect. Again, I’d like to clarify that this is not because Theatre Paradok employs absurdism to tell its story, its because the context of the piece is entirely absent from the work itself. Its difficult to establish a performative flow when you aren’t quite sure what the performances are meant to embody, so some engagements between characters can detract from the momentum of the piece. This detraction is most apparent in the interjections of the monochromatically dressed characters that disrupt AI’s E and V’s conversation- these sequences pale in comparison to the central, compelling narrative between E and V, and I found myself patiently waiting for these segments to end in order to continue with the more engaging AIs. The purpose of the monochrome characters and their male counterparts seemed to be that they represented living caricatures of gender bias, as one of the AI’s observing them remarked “is that what all men and women are like?” but this is just my interpretation. 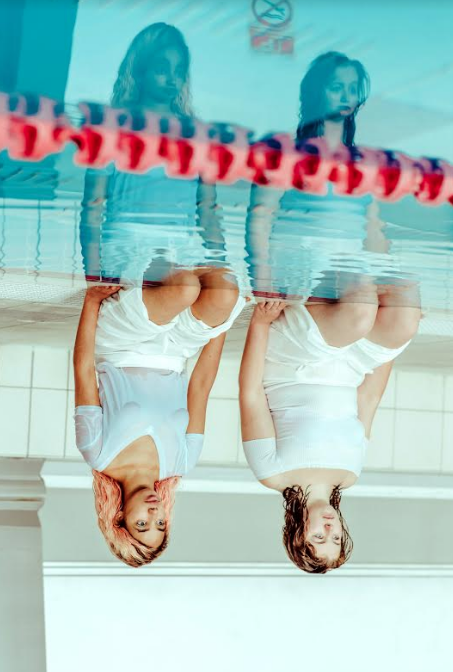 In terms of technical and performative work, Like Drowning does boast some impressive performances, from Anna Philips and Grace Dickson in particular, who take the narrative through vibrant character monologues, poems, and conversations. The two brilliantly convey some powerful emotions and through them, Like Drowning makes me deeply aware of the beauty and complexity to be found in humanness. It’s a funny outcome, for a show created in collaboration with machines. Though I am aware this doesn’t seem to line up with the intentions, I felt Paradok Theatre’s piece did a wonderful job at exploring feelings around concepts like vulnerability, love, and heartache. So though I was unable to experience this piece to the full extend of its intentions, the artistry of its narrative was still able to shine through. Like Drowning is on at The Space at Niddry Street everyday at 6:50 till the 25th.